The Travelon AT Classic Pleated Hobo bag has plenty of room for your essentials and tons of protection to keep them safe. It is equipped with a slash-proof construction to keep contents secure from a bag-slashers. A cut-proof strap keeps street thieves from slicing the strap and running off with your bag, and a lockable main compartment keeps the hands of pickpockets out. This bag has pleated front zippered pocket which is RFID protected with 5 credit card slots, and 2 passport pockets, this RFID protection helps to keep personal information safe from thieves. Treat yourself (or someone you love) to a stylish Travelon anti-theft bag with its own pickpocket- proof locking compartments and you will never need to worry about this common crime. The Travelon Anti-Theft Classic Pleated Hobo - Midnight has many exciting features for users of all types. You can extend the lifetime of your Travelon Anti-Theft Classic Pleated Hobo - Midnight with the purchase of a FactoryOutletStore Factory Protection Plan. 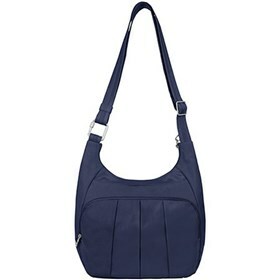 See the Travelon Anti-Theft Classic Pleated Hobo - Midnight product video above for more details. The Travelon Anti-Theft Classic Pleated Hobo - Midnight is sold as a Brand New Unopened Item.